According to a 2015 research study by the Open Institute and the Asia Foundation collected in September 2015 shows that Cambodia’s phone market is already saturated, with over 94% of Cambodians claiming to own their own phone, and more than 99% being reachable through some sort of phone. The proportion of citizens using more than one phone was only 13.1% while one Cambodian in four uses more than one operator. These numbers are similar to those reported in previous years. The results show that 63.3% of Cambodians own phones with Khmer script capability. The use of such phones is more common among men (67.6%) than women (49%) and more common in urban areas (67%) than rural (61.7%). Some 39.5% of users were found to have at least one smartphone. 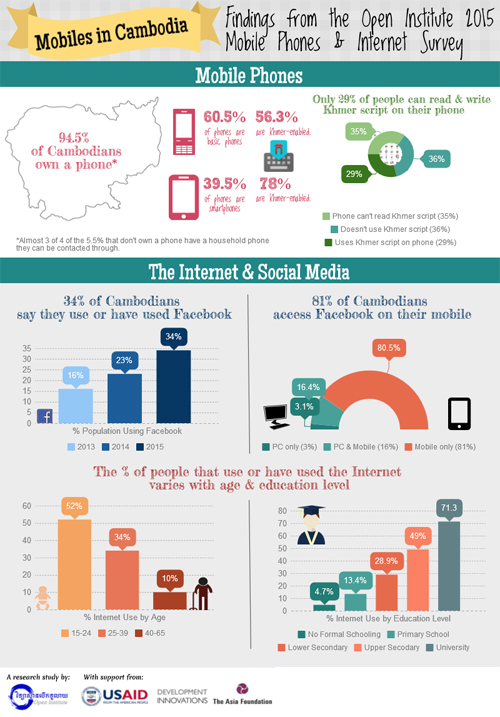 The ability of phones to display Khmer is more common in smartphones (78%) than in dumb phones (56.3%). The capability of smartphones users’ ability to display Khmer improved with the education level of their owner. 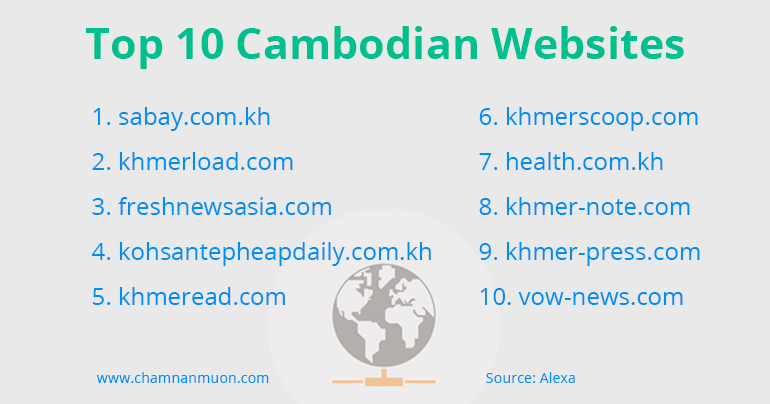 It was found that almost a third of Cambodians have access to the Internet and Facebook and that most of the people in this group have their own Facebook accounts. Smartphones are by far the most common means of accessing Facebook; only 3% of users access the social media site solely through computers while 80% access it exclusively through phones. Internet/Facebook use has risen to become in 2015 the second most important channel for Cambodians to access information—trailing the only TV (30% vs 24%)—having surpassed radio (20%) and continuing to gain market share yearly. To increase the rate of adoption, the development of better text-prediction and input methods for Khmer script in phones is recommended.